English Heritage chose the Spike as the heritage site to launch their annual report for the South East called Heritage Counts. The event was attended by press and a television crew from Meridian Thames Valley. It was great that our community and heritage project was chosen to represent this years EH theme which was based on the role communities play by caring for and engaging in England's heritage - was there a better site? Never! 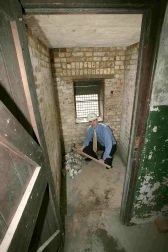 EH regional director Andy Brown put to hard labour in one of the recently repaired stone breaking cells. For the first time in two years the Spike was back in the official tour brochure and what a difference it made. In 2005 we had roughly 50 visitors over the two days, this year we had more than 350. Many were first time visitors but there were also some familiar faces from last year who had come back to see how we were getting on. Only certain parts of the building were open due to the building works but all visitors saw enough to realise the importance of the building with regard to our heritage. Queuing to get in at times we had three tours happening simultaneously! At Last the builders have turned up! Lampard and Partners started on site with a good weeding session that was carried out at great speed by their more than enthusiastic Polish division. Only 45 weeks to go! Heavy Metal band Zero Cipher spent the day recording their new video called 'It's No Secret' which is a track on their all new 'Diary of a Sadist' album. The picture above shows three of the band with the make up girls (they don't really look like that). On the left is Barnaby Whattingham the other two I can't quite make out behind all the finely applied make up but its either Duncan and Ryan, Ryan and Joe or Joe and Duncan. We wish the band every success with their new album and look forward to the royalties pouring in! 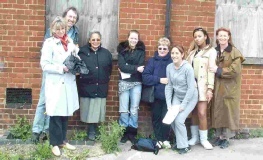 Dr Judith Carmel Arthur and students from her History Course at Hillcroft Women's College in Surbiton visited the Spike and had the full tour of the building. A very enthusiastic group who were a pleasure to show round. The second on the Toby walk is celebrated at the Spike by all those involved. Last opening before building work is due to start. At Noon the Charlotteville Jubilee Trust became the owners of the Spike for the next 125 years - the clock is ticking.